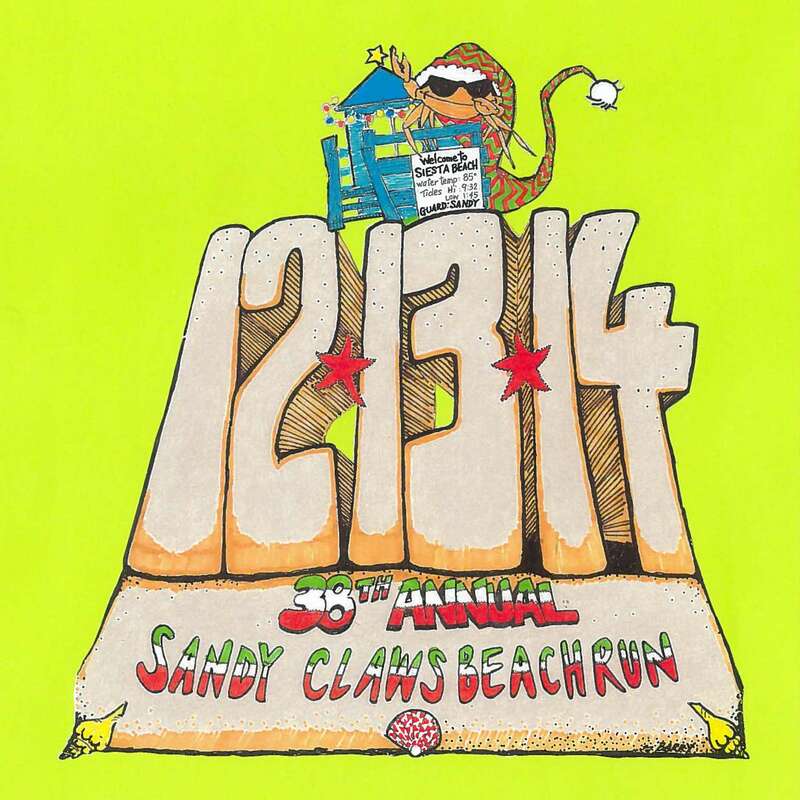 Remember where you were on 12-13-14 when the 38th Annual Sandy Claws Beach Run returns to beautiful Siesta Beach, Best Beach in the USA! This race, sponsored by Sarasota County Parks, Recreation and Natural Resources and Drs. Anderson and Brannan - DOCs, is sanctioned by the Manasota Track Club and chip-timed. The brilliant, white, pure quartz sand is hard-packed making for fast finish times or set a leisurely pace and enjoy a tranquil morning with shorebirds and perhaps, dolphins playing in the gulf. Try kinesiology taping offered pre- and post-race and enjoy the post-race party with music, holiday-themed costume contest, raffle prizes, holiday photo op, food and beverages. Custom awards to overall categories and age group winners, 1st-6th place. Proceeds benefit Summer in the Parks’ Adopt-A-Camper scholarship program. Pre-registered runners receive the highly collectible long-sleeve event shirt in your choice of wicking or 100% cotton and goody bag. Race day registrants receive event shirts while supplies last. Custom trophies are awarded to male and female overall, master, grandmaster, senior grandmaster, veteran. Age group winners 1st-3rd place receive custom trophies and 4th-6th place receive custom ribbons. All Fun Run participants receive ribbons. Kinesiology taping pre and post race. Holiday photo op - remember your camera! Race day registration: 7-8:15 a.m.
One-mile Fun Run start: 8 a.m.
Holiday-themed costume contest: 9:35 a.m.